Lace up your sneakers and join us for the 19th Annual Riverwalk Run at Huizenga Plaza on Saturday, April 6th, 2019. This event, hosted by the Junior League of Greater Fort Lauderdale, will honor the League’s 80 years of service, and its impact on improving the surrounding community. The Riverwalk Run is a day of fitness and fun for the whole family. All fitness levels are encouraged to attend! 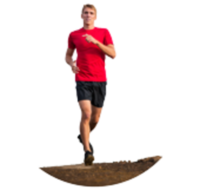 Options include running the 5 mile USATF Certified Course or the 5K course. 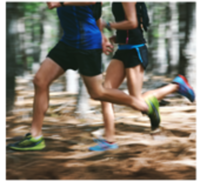 A separate 5K Fitness walk is perfect for those who wish to take a slower pace. Staggered starts for each participating category will be in place. This year your kids can compete, too! Encourage them to sign up for the “Kids’ Fun Run,” a 1K course lined with parents and volunteers to cheer them on. Post-race festivities include a fabulous champagne brunch, activities for kids and an awards ceremony for top race finishers. Do you have Furry Friend who'd like to tag along? This year friendly dogs are welcome and they can enjoy their very own Doggy Fun Zone at the event. Just be sure to sign them up, and don't forget a leash! The Riverwalk Run will begin at 8:00 a.m. with same day registration and fun activities beginning at 6:45 a.m. The cost of the event is $35 for the 5K/5-mile, or you can join us for $45 on the day of the race. The Kids’ Fun Run costs $15 in advance and $20 on race day. And for that special pup, the cost is $10 - even on race day! *If you would like to join the event as a team, a 5 person MINIMUM is requested to receive a 10% discount at time of registration. More than 1,000 runners are anticipated, so register now to secure your spot and vist www.RiverwalkRun.com for more information and updates. 32 East Las Olas Boulevard in downtown Fort Lauderdale. The Riverwalk Run is a timed event and an official accredited course. Timing and scoring will be provided by a third-party, accredited organization. More details to come! All participants will receive a unique, newly designed, participation medal. Online registration is available at www.RiverwalkRun.com! You can register in person at Packet Pick-Up or on the day of the Riverwalk Run beginning at 6:45am. Accepted forms of payment include cash, check, Master Card, Visa and American Express. If you are a company, or simply have a group of friends who want to participate in Riverwalk Run, we’d love for you to join us! 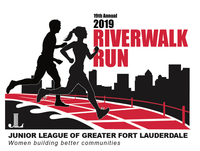 Proceeds from the Riverwalk Run support the mission of the Junior League of Greater Fort Lauderdale, one of our community's longest serving non-profit organizations. This signature event sustains the Junior League's commitment to key issues affecting our commuity such as human trafficking awareness, assisting adolescents in foster care to independent housing, childhood fitness and nutrition, and more!